In this chapter we will learn about the Hebrews and Chaldeans (Neo-Babylonians), two groups of people whose histories became intertwined. The Hebrews are named after their language called Hebrew, Hebrew is a Semitic language. The ancient Hebrews were nomadic people who moved throughout the Fertile Crescent, finally settling in a place called Canaan. The Hebrews are a resilient people; while the Sumerian, Akkadian, Babylonian and Assyrian cultures have ended, the Hebrew culture continues to this day, and has had a lasting impact on our world; this despite the Hebrews being scattered, enslaved, and persecuted throughout their history. Today their religion is known as Judaism. A belief in one god (monotheism) forbid the Hebrews from worshipping any other gods. Abraham marks the beginning of Hebrew history. Abraham lived in Ur, where his father was a seller of idols. Abraham rejected his father's gods and goddesses, he believed in only one god. Abraham and his wife Sarah left Ur. According to Abraham, his god promised him and his followers a land they could call their own. Abraham eventually settled in a land called Canaan. Hebrews are also known as Jews, this word comes from one of their ancient kingdoms known as Judah. You may recall from the last chapter that King Hezekiah of Judah refused to pay King Sennacherib of Assyria tribute, and Sennacherib invaded Judah, attacking the city of Lachish. Hebrews are also referred to as Israelites, a word that comes from Abraham’s grandson, Israel. This was also the name of the nothern kingdom of the ancient Hebrews. The story of the Hebrew people is told in the Torah, a sacred book to its people. At one point in their history, the Hebrews ended up in Egypt. There are many theories as to why the Hebrews left their homeland of Canaan. We will go into more detail when we study Egypt. Eventually, a man named Moses led the Hebrews out of Egypt and back to Canaan. Abraham's Route from Ur to Canaan. Why do you think he did not take a direct route? 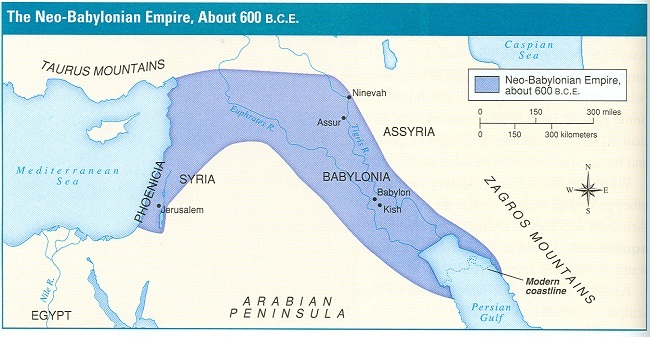 The Neo-Babylonian Empire, which included Assyria and Judah. Find Jerusalem on the map. The people living in Babylonia at this time were the not Ammorites of Hammurabi's time but a Semitic group called the Chaldeans. In 612 BCE the Babylonians, led by King Nebopolassar, joined with their allies the Medes and destroyed Nineveh, this brought an end to the Assyrian Empire. 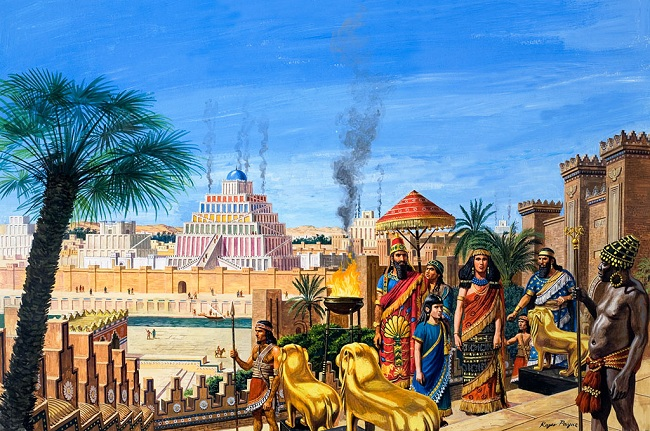 Babylon enjoyed one more moment of greatness in Mesopotamia. One of the most recognized kings of the Neo-Babylonian Empire was Nebuchadnezzar II, the son of Nebopolassar. Nebuchadnezzar II ruled from 605 to 562 BCE. Nebuchadnezzar II is known for attacking the kingdom of Judah, as Sennacherib had once attempted but failed a hundred years earlier. Nebuchadnezzar II was successful, in 586 BCE, he destroyed the Jewish temple in city of Jerusalem. Nebuchadnezzar II forced thousands of Jews to move to Babylon, many served as slaves. This is known as the Babylonian Captivity. King Nebuchnezzar II, King of Babylon, behind the king is the Ishtar Gate, the northern entrance into the city with its blue, baked tiles. Not all the Jews in Babylon worked as slaves. Daniel, for example, became an advisor to King Nebuchadnezzar II. Jewish history records that Daniel interpreted the dreams of Nebuchadnezzar II, after his own Babylonian priests had failed. Nebuchadnezzar II rebuilt the city of Babylon. Highlights included the northern entrance to the city called the Ishtar Gate, dedicated the goddess of love and war, Ishtar. The Ishtar Gate was a high archway made from blue, baked tiles with large cedar doors. This gate was part of the impressive walls of Babylon. There is another account of Nebuchadnezzar II, it tells of a "hanging gardens" that he built. In ancient times alliances and friendships between two groups of people were often times strengthened through marriage. 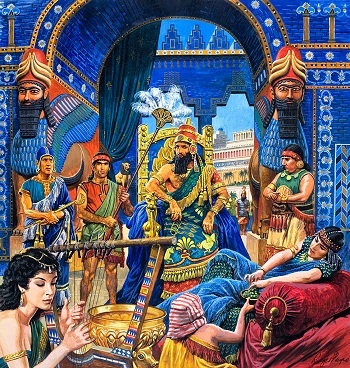 King Nebuchadnezzar II of Babylon married Amytis, the Median princess. When Amytis moved to Babylon, she was unhappy. The landscape of her homeland was mountainous, green, and full of life; Babylon was flat, dusty, and lifeless, except for the area of fertile soil near the Euphrates river. Amytis became homesick for her land. Nebuchadnezzar II, very much in love with his new wife, ordered that a garden of trees and plants from her homeland be planted, and irrigated on a building that resembled a mountain. This structure became known as the Hanging Gardens of Babylon. Many Greek writers who visited Babylon mentioned these gardens, though Nebuchadezzar II himself never mentions them at all. Some people today think the gardens were just a myth. You can learn more about the Hanging Gardens of Babylon, by watching the video below. The Neo-Babylonian Empire ended with Nebonidas, the last of the Chaldean kings. Nebonidas was unpopular with the priests of Marduk, the favorite god of Babylon, because he favored Sin, the moon god. Some history records that the people of Babylon opened the gates to the city so Cyrus the Great, King of Persia, could enter and take over from the unpopular Nebonidas. Other accounts tell of Cyrus holding back the Euphrates river so his army could enter by way of the dried river bed, which ran through the city. In either case, Cyrus and the Persians became the next to dominate Mesopotamia. With Cyrus as the ruler of Mesopotamia, the Jews were allowed to return to their homeland, as long as they recognized Cyrus as their overlord. We will learn more about the Persian Empire when we study the Greeks. This is Nebonidas, the last Babylonian king, who may have been so unpopular with his subjects that they may have opened the gates of Babylon to let Cyrus, the Persian king, take the city. The Jewish Diaspora (Greek word meaning - When a particular group of people is forced to leave its homeland) Notice that the ancient Hebrew people had been moved from their homeland for many centuries, beginning with the Assyrians and then the Neo-Babylonians. 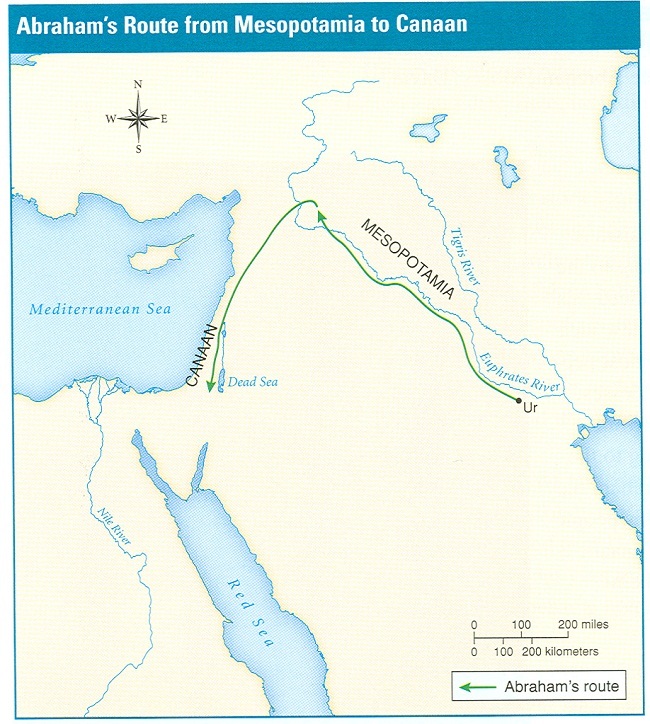 The green route shows the Jews returning to their homeland, though under the rule of Cyrus the Great of Persia.